Delft is best-known the world over for its Delft Blue pottery. However, a visit to this charming town in the province of South Holland (Zuid-Holland) reminds us that Delft’s appeal extends way beyond its famous earthenware. It is a also city of art, captured in canvas by Vermeer and others. What’s more, Delft has a long and direct connection to William or Orange, Dutch royalty and its glorious past. 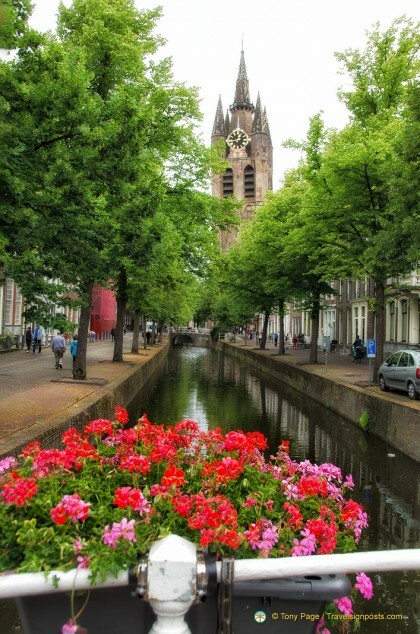 Delft is a typical Dutch town located north-west of Rotterdam and we’re making a stop here on our way to The Hague. A quick orientation walk around the Voldersgracht, one of the oldest canals in Delft, and we are quickly reminded that we are in a Dutch town. 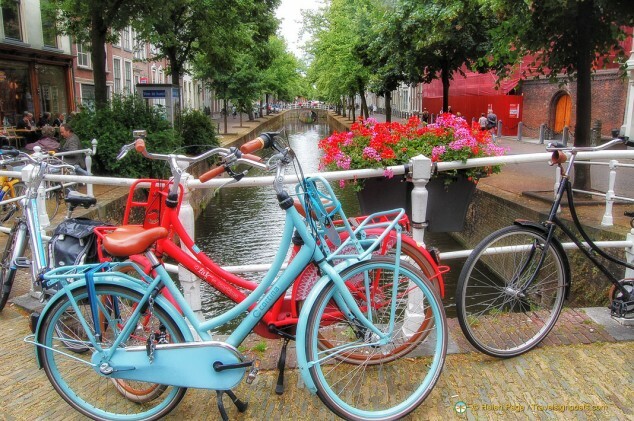 Tree-lined canals frame this charming part of the old town and the many canal-side streets are linked together by humpbacked bridges, with the iconic bicycles chained to their railings. 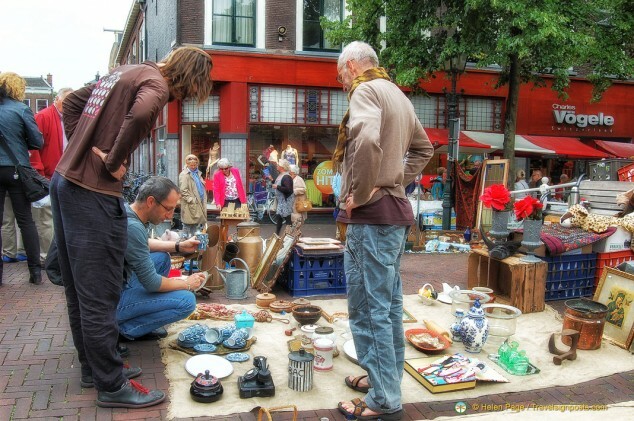 Being Saturday, the popular Antiques, Bric-a-brac and Book Market is in operation and if this is supposed to be one of Delft’s best kept secrets, then they’re not hiding it very well. It is a huge, thriving market with all kinds of stalls lining both sides of the canals. Hoping to score a bargain on antique pottery, I try to get some tips from a couple of young guys on how to spot “real” antique pottery. They appear to know what they are looking for, but they aren’t sharing their secrets. Is Kibbeling a Taste Sensation? It is lunchtime and around the Voldersgracht there are plenty of cafes and eateries, including floating cafes, offering snacks and lunch. 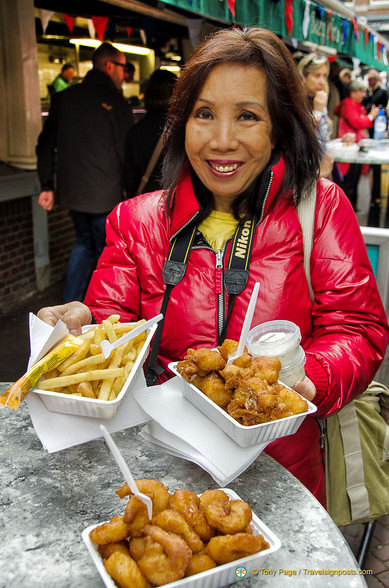 Our Dutch guide raves about kibbeling and highly recommends that we try some. Visbanken, a long-established fast-food seafood stand, happens to be at the beginning of Voldersgracht and here we have our first try of kibbeling (fried cod pieces), chips and some prawn fritters. As we prefer the lighter beer-battered fish that we’re accustomed to back home, we find the kibbeling batter a bit heavy and greasy. Frankly, we didn’t find the kibbeling a taste sensation, but probably because the cod from these fast-food places isn’t of the best quality. The sound of marching bands and loud music interrupt our lunch. I ask a lady at the market what the celebration is about. Ho-hum, she didn’t appear too interested and says that it is very common to have music and marching bands in town. But I manage to find out from another source that it is Delft Blue Day – in fact it is their inaugural Delft Blue Day celebration (June 21st). All around town, blue is the highlight colour and on this day you can immerse yourself in Delftware by visiting museums dedicated to ceramics and Delft earthenware, experience ceramic art in the galleries and shop for Delftware in the numerous shops and factories. 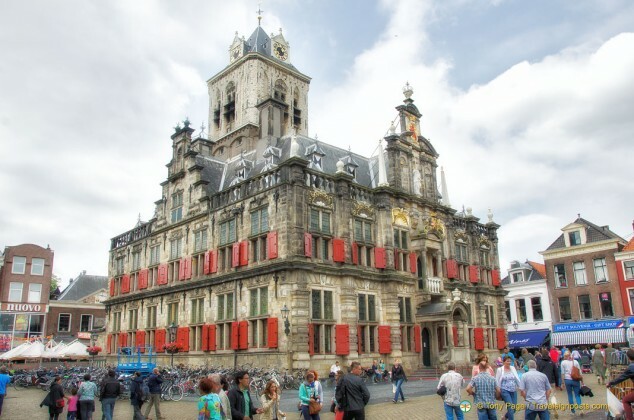 Much of the activity in Delft is concentrated on the market square with the impressive Stadhuis (Town Hall) and Nieuwe Kerk (New Church) facing each other at opposite ends. Although the origin of Delft dates to the start of the 11th century, most of the city’s monumental buildings are 17th century re-creations. In 1654, the national gunpowder store exploded and destroyed much of the city. The Delft Explosion or Delft Thunderclap, as it is also known, killed over 100 people and injured thousands of others. Het Prinsenhof (Princes’ Court) – This was where William of Orange was shot and in the wall you can still see the bullet holes. It is now a museum where you can learn about the Eighty Years’ War and the role of the House of Orange in this battle. Vermeer Centrum – offers a journey of discovery through the life and works of Johannes Vermeer. Vermeer and several other notable Dutch painters lived and worked in Delft and were members of the Delft School. Most of their paintings are based on domestic life, church interiors, courtyards, squares and the streets of Delft. There is so much to see and do in Delft and on our short visit here we’re merely scratching the surface of what this town has to offer. But it also whets our appetite to come back and see more. There are many hotels in Delft that enjoy canal views and these include the 4-star Hotel Royal Bridges, Hotel Leeuwenbrug, Hotel Grand Canal Station Delft and Bridges House Hotel Delft. For the complete list of hotels in Delft see Here. 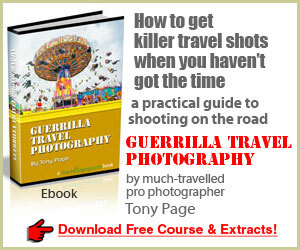 There are direct trains from Den Haag, Amsterdam and Rotterdam to Delft as well as buses from Den Haag and Rotterdam. From Amsterdam, there are also a couple of day trips that you can join which will take you to Delft, The Hague and Madurodam.